Get ready fur an epic adventure with an emo-catssassin Murtair of the Red Dot Order, a proud clericat Francat of the Great Bowl of Goodness Temple and the one and only... THE CHOSEN CAT! Witness kitten mythology and real life kitten problems! Start in a lovely town of Catshire, travel towards the great city of Tomcat Gate and even further across the majestic world of Nyanya. Fight catorcs, murmies and furniture, pray to the Kitty Gods and sharpen your claws! Decide whether you want to be a good kitten or an evil avatar of hatred (scratching involved)! What's the story of your team? Are you guys all from Warsaw? Adrian: The core of our team is made up of two people - Ilona and me. I am a programmer, game designer, quality engineer and whatever is necessary, actually. I’ve worked in the game industry since 2006. Ilona: I write and draw stuff. I’m mostly known for my webcomic. Some of the episodes are translated now; you can find them on Facebook, the fanpage is called Snailish. I kinda wanted to try my hand at making games. I met Adrian by pure accident at a few fantasy conventions. We decided it must be some sort of destiny or whatever, so we exchanged phone numbers. Back then, I was doing my comic stuff and Adrian was working at a game studio in Gdańsk. When the parent company decided to shut down the studio, Adrian decided to team up with me. That was 2014. We live together now and make silly games. It would make a nice love story, but since Adrian was and still is in a steady relationship with Jesus — that’s not going to happen anytime soon. Adrian: Also, neither of us is from Warsaw, I’m from a town north of Warsaw, and Ilona is from the south, exactly three bus stops from the Warsaw city limits. What is game development like in Poland? Adrian: It’s hard for us to compare Poland and other countries, since neither of us ever tried to make games abroad. We suppose that it’s harder to make them here than in the US, but certainly easier than in North Korea, for example ;) At the moment, there are about 300 game studios in Poland. And since many of us are kinda poor compared to western Europe, we have to get creative and effective with what we have. Ilona: Basically, what we have is mostly overtime and dreams of a better life. What has the feedback you’ve got so far on the game been like? How do you reach out and engage your players? Adrian:There are two kinds of reactions - some people don’t know or like cRPGs, they don’t read the text and madly push buttons expecting for something to explode, I suppose. The ones who are OK with reading mostly laugh or have various WTF expressions on their faces, usually asking us to put them in touch with our drug dealer. [EN: Please check your inbox, quick question! :D] Overall, the feedback has been positive. Ilona: We reached people mostly through Facebook, taking advantage of my webcomic’s audience, as well as at small Polish conventions. The first and only way of reaching audiences abroad was through Steam Greenlight, where it was well-received. Then we signed a deal with our publisher, who started to do some marketing with ChinaJoy, Gamescon and PAX. 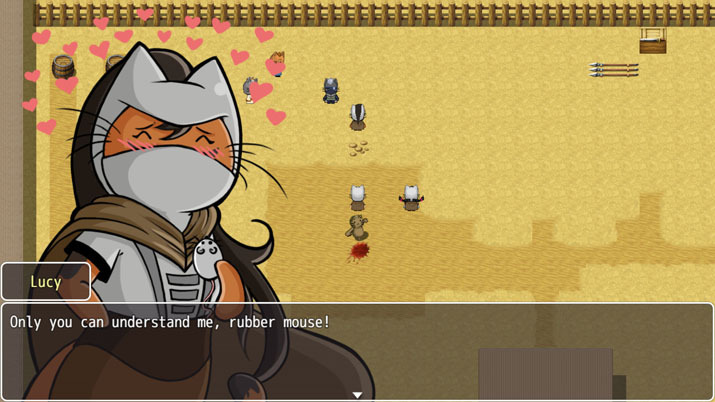 They also made a fanpage exclusively for The Chronicles of Nyanya: up to that point we only wrote about the game on the fanpage of our hamstercube studio. Given the subject matter, where do you see the most potential to sell this game? Adrian: Since the game is filled with pop culture and anime references we hope that USA and Japan will like it. Ilona: I’d be super happy if Japan-senpai noticed us. How did you make sure you passed Steam Greenlight? What does it mean for a studio to attempt to get greenlit? Ilona: We didn’t do anything, we just made the game. We tried to make the trailer seem interesting, but had no idea what we were doing. It’s actually our studio’s motto - “no smarts, lots of enthusiasm”. Adrian: Steam Greenlight had its flaws, but it was a great way to see what people think about the game. The fact we passed it quite quickly was confirmation that somehow we kinda did something right. You went to ChinaJoy. How are you integrating visits at expos into your marketing plan? What happens there that helps the game? Ilona: We don't really have a marketing plan, that would require smarts. We let our publisher worry about that, we sometimes just come along for the ride. However, seeing how people play the game and hearing their feedback is always very valuable. Adrian: The game was made with Europeans and Americans in mind, so we experienced some cultural shock when we presented the game in China. For example, we were told that they don’t really have rolls and buns like we do, they have their own kind. And this sort of food is crucial in the game, since it's an equivalent of all sorts of animals. So yeah, learning that was really helpful.